I ended up adjusting the original recipe slightly due to the amount of chicken I thawed, which ended up giving me just over 1.5 lbs of ground meat. My saute pan wasn’t quite large enough to hold all the meat mixture; I ended up having to toss about 3 meatballs’-worth because I didn’t want to overcrowd them. Instead of shaping beforehand, I used my little cookie scoop and dropped the meatballs right in the sauce; quick and convenient, and just the right size. I served with farfalle and completely forgot about adding the garnishes (not that I had olives anyway). Some feta would have been a nice touch, but as I said, we liked it perfectly fine as is. 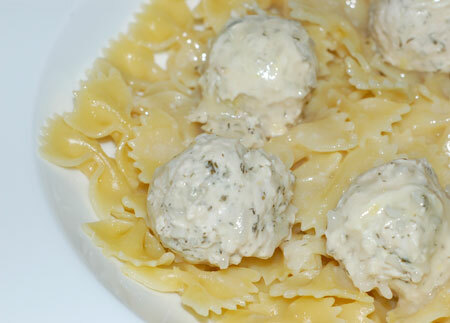 To make the meatballs, knead all ingredients together with your hands—mixture will be soft. Refrigerate meatballs while preparing the sauce. Preheat oven to 375F. In an ovenproof 12-in saute pan, warm butter over medium heat. Stir in flour until smooth, then gradually whisk in chicken broth, lemon zest and juice. Bring to a simmer and season to taste with salt and white pepper. Using a small scoop, gently put the meatballs into the sauce and cover the pan. Place in oven and bake for 40 minutes. Transfer to serving dish and sprinkle with feta, olives and parsley to serve. Serve over orzo pasta or rice.